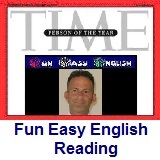 ﻿ Fun Easy English - reading practice and learning about the holiday Veterans Day. This is a very important holiday in order to honor those who made tremendous sacrifices defending the rights and freedom of others not only in the United States but throughout the world. I dream of a world of total peace someday free from persecution, genocide, discrimination, and hate. This is an achievable goal if we all make more of an effort and work together. 1. Veterans Day honors people who served in which of the following? 2. Veterans Day is which type of holiday? 3. Veterans Day marks the anniversary of the end of which of the following? 4. If Veterans Day falls on a Sunday it is typically observed on which day? 5. Which of the following is usually closed on Veterans Day?